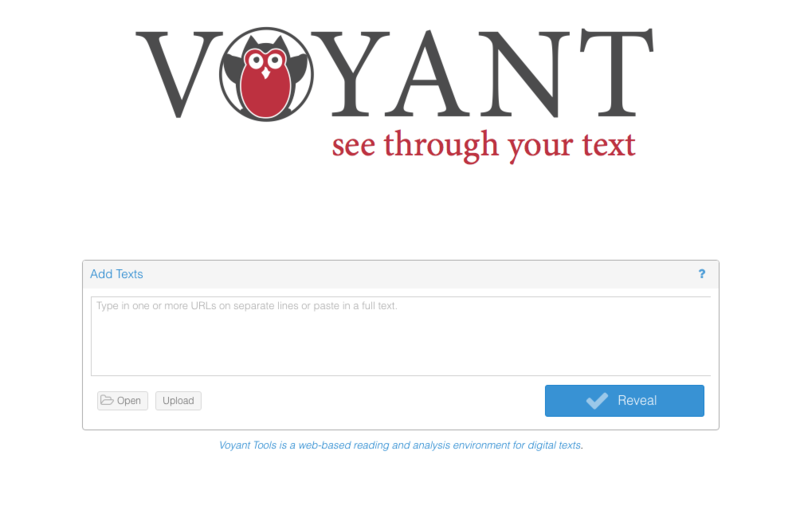 Voyant is a web-based text analysis environment. 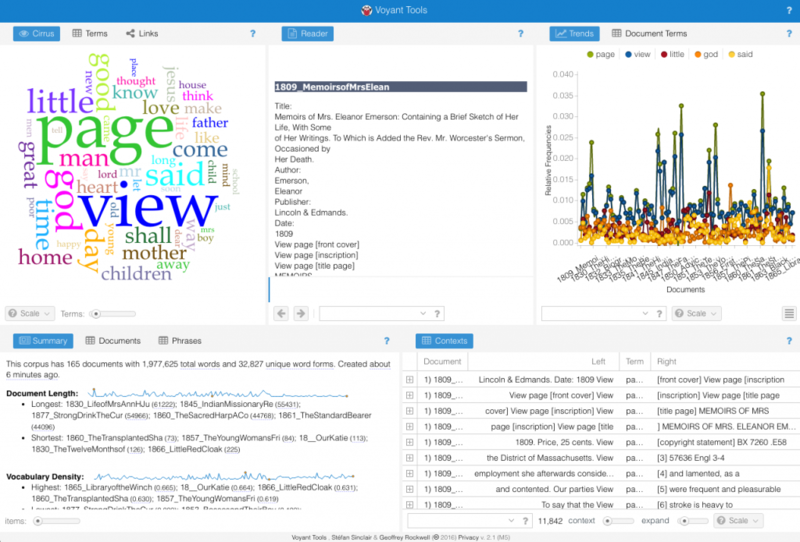 The tool allows you to read and explore a corpus of texts using a multi-panel interface. The interactive visualizations that result from these explorations can be embedded in web pages. Once opened, in what they call the “default skin”- you will see five panels. Each of these is a tool, Cirrus, Reader, Trends, Summary, and Contexts. These tools interact with one another – if you modify one pane, you’ll see another update. Export – opens a window in a tab of its own with export options. Choose another tool – opens a dropdown menu with options. A word cloud that visualizes the top frequency words of a corpus or document. Central location and large size indicate greater frequency. Text Reader- displays text for reading. Prospect Viewer- displays an overview of the entire corpus. Provides information about the corpus. shows each occurrence of a keyword with surrounding text. A line graph that depicts the distribution of a word or words (occurrence across a corpus or document). Additional tools can be added using the Choose Another Tool button described above. Click Export at the top of the page, select “an HTML snippet” and click export for the snippet to appear. Copy and paste the snippet in your page. Header Image: Missouri State Archives via Flickr Commons.